We design, build, and install closets & cabinets. 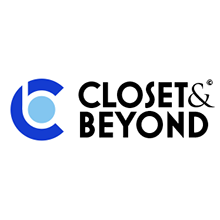 WE ARE AN EFFECTIVE TEAM Here at Closet & Beyond, we see your home as more than a building – it’s your personal refuge, the space where you can truly relax and be yourself. We’re committed to creating closets that fit you, your home, and your life, so you can spend less time searching for your belongings, and more time enjoying what really matters to you. or over 25 years our interior design professionals have been transforming living spaces with customized design solutions. During that time, we’ve helped countless clients achieve the interior of their dreams, complete with all the must-have features that sets our work apart. Working from our headquarters in the Washington DC Metro area, we’ve built a reputation as the industry leader in full-service space management for discerning homeowners. Our team of installation experts and builders all have exceptional skills in their chosen craft, and their workmanship is second to none. We take the time to focus on all the little details that go into creating closets and storage spaces that look beautiful, function perfectly, and last a lifetime. From the beginning, our focus has always been on providing exceptional customer service from the moment you first call us to when we install the last shelf in your custom closet. We take the time to listen to your needs and wants, learn about how you use your living space, and discuss design options that can make your new custom closet truly yours. We believe that your closet should be more than simply a well-organized storage space – it should be a reflection of who you are, a functional tool that makes starting or ending your day stress-free, relaxing, and simple.